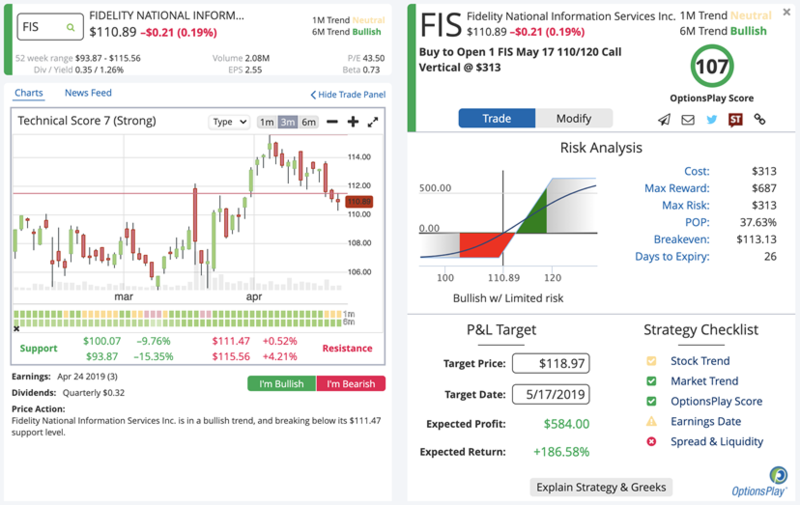 The bullish DailyPlay we chose for Monday, April 22nd is Fidelity National (FIS). FIS is part of the Technology Sector (XLK). XLK has rallied 6.24% higher over the past month and its 1m and 6m trend turned bullish on March 11th and just set a new 52 week high. Fidelity National’s 6m trends turned bullish on Feb 10th and recently broke above its $110 resistance level which now becomes support. 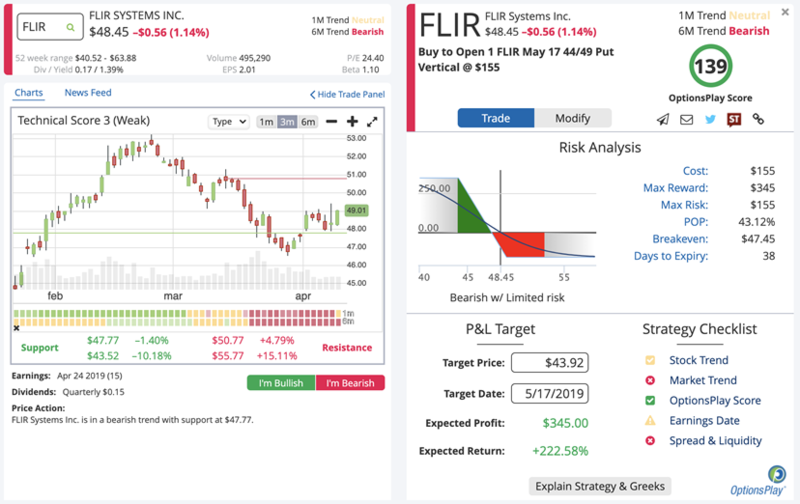 With a technical score of 7 (out of 10), FIS is a strong stock that will likely continue higher. As a stop loss, if FIS was to trade below $110 for multiple days, this would invalidate our analysis and suggest getting out of the trade. How to Maximize Your Profits with Credit Vertical Spreads – April 25th @ 4:15PM EST –Register Now! 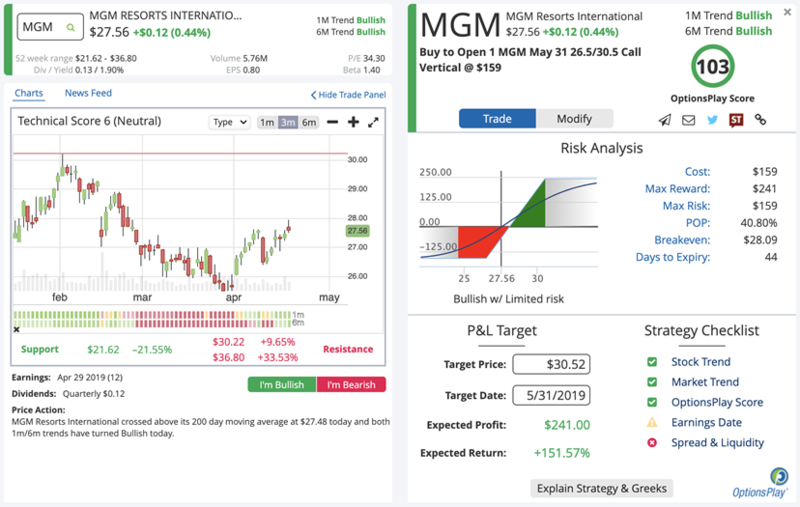 The bullish DailyPlay we chose for Thursday, April 18th is MGM (MGM). MGM is part of the Consumer Discretionary Sector (XLY). XLY has rallied 6.31% higher over the past month and its 1m and 6m trend turned bullish on March 15th and just set a new 52 week high. MGM’s 1m and trends turned bullish on April 12th while breaking above its $27 resistance level which now becomes support. With a technical score of 6 (out of 10), MGM is a neutral stock that is starting to trend higher. As a stop loss, if MGM was to trade below $27 for multiple days, this would invalidate our analysis and suggest getting out of the trade. How to Maximize Your Profits with Debit Vertical Spreads – April 18th @ 4:15PM EST –Register Now! 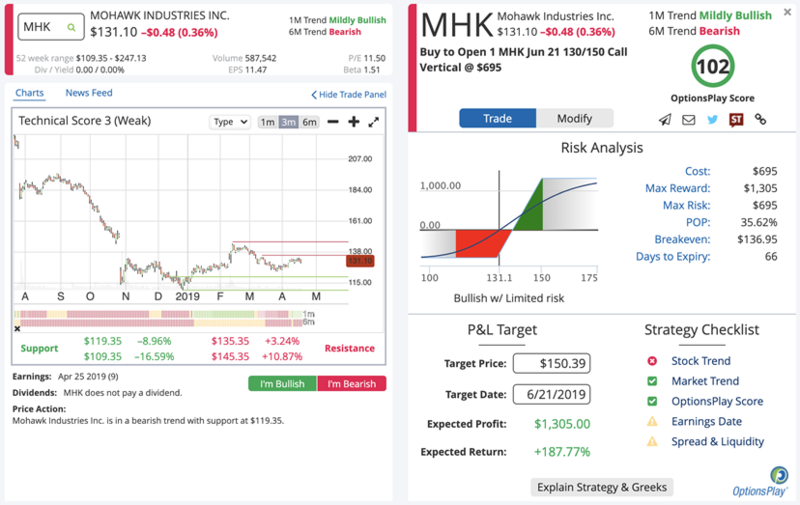 The bullish DailyPlay we chose for Wednesday, April 17th is Mohawk Industries (MHK). MHK is part of the Consumer Discretionary Sector (XLY). XLY has rallied 6.64% higher over the past month and its 1m and 6m trend turned bullish on March 15th and just set a new 52 week high. Mohawk’s 1m and trends turned bullish on April 5th while breaking above its $130 resistance level which now becomes support. With a technical score of 3 (out of 10), MHK is a weak stock that is starting to trend higher. As a stop loss, if MHK was to trade below $130 for multiple days, this would invalidate our analysis and suggest getting out of the trade. How to Maximize Your Profits with Debit Vertical Spreads – April 18th @ 4:15PM EST – Register Now! 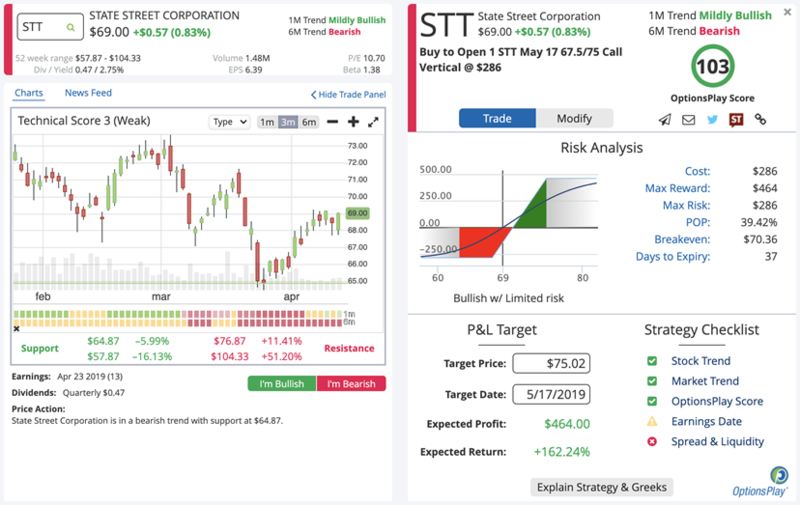 The bullish DailyPlay we chose for Thursday, April 11th is State Street (STT). STT is part of the Financial Sector (XLF). 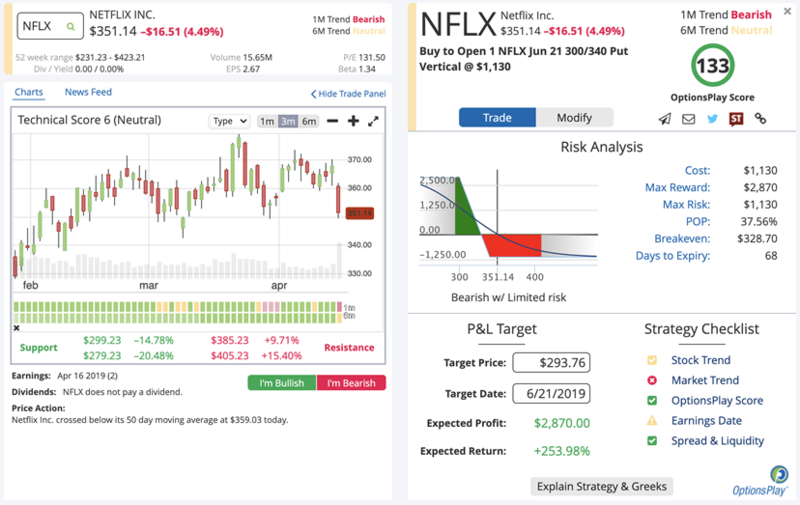 XLF has rallied 0.72% higher over the past month and its 1m and 6m trend turned bullish on April 1st while breaking above its $26 resistance level. State Street’s 1m and trends turned bullish yesterday while bouncing higher off is $68 support level. With a technical score of 2 (out of 10), STT is a weak stock that is starting to trend higher. As a stop loss, if STT was to trade below $68 for multiple days, this would invalidate our analysis and suggest getting out of the trade. Wealth365 Summit: Top 3 Strategies for Generating Income w/ Weekly Options – Thurs 4/11 @ 9:00AM EST –Register Now!